Sometimes you just want to get up close and personal with bamboo, waterfalls, streams and/or views without committing the entire day. What if you could do it all in one 4-5 hour adventure? 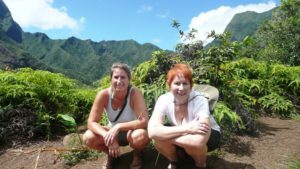 Well now you can with our custom Maui hiking tours which take you to the north shore of Haleakala (East Maui), the east side of West Maui or the south side of Haleakala and the desolate and unsurpassed beauty of Maui’s most recent lava flow! Experience what you have dreamed of today. We will make it happen! We can take kids of all ages including those in their 70’s as long as they have the will and ability to hike a couple miles or less. Good balance is important, but let us know if you need assistance because we do have hiking poles. PLEASE VISIT FAQ page for information about hotel pick-ups. BOOK YOUR HIKE today!